We spent Friday procuring equipment and supplies for the remainder of our expedition. Northbound from Montreal meant little in the way of civilization ahead. We found an outdoor recreation store and replaced our busted dry bags, torn map case, and squirrel stolen knife. We bought oatmeal, nuts, and raisins to prepare five weeks worth of granola. We calculated how much we’d eat in a day and bought cornmeal for breakfasts and rice, lentils, and cheese for dinner. Everything fit in the boats, barely. We also put chickpeas on the stove for lunch and walked Montreal’s old French quarter for the jazz festival. After a 45 minute rainy walk along a canal, we arrived in old Montreal and remembered we hadn’t turned the chickpeas off. Our hosts were out of the house. As we rushed back, we hoped we hadn’t ruined the chickpea pot or burned the house down. We hadn’t. The lightly salted chickpeas melted on our tongues. Back on the water we enjoyed a cooler cloudy day progressing down the calm waters of the Richelieu. 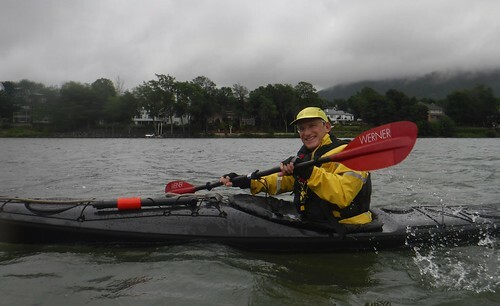 We met a fellow paddling a very fine kayak designed by Johan Wirsen, for whom I sell kayaks. It was pleasant to chat with a serious sea kayaker headed in the same direction, if only for an hour. We ended our day at the Saint Denise marina where we found an empty clubhouse with showers,couches, and a pool table. We looked for people to get permission to use the facility, found no one, and a had a very comfortable if slightly nervous night’s sleep.